Anonymous, 06 Sep 2013: When the Samsung CEO announced the Galaxy Note 3, http://youtu.be/4ihkiREluBM?t=6m49s ... moreOh yeah, clap clap clap to samsung. Is not required to clap sometimes, the awesomeness also have silence. Holding both phones the z1 bezel is about 1mm thicker than the s4, and same with the htc one, except the s4 and htc one's screens have about 1mm of black between where the pixels start and the bezel so the z1 does not have a huge bezel unless you think the smaller screen htc one or s4 has a huge bezel too. AnonD-156767, 07 Sep 2013I was really planning to buy the z1, until the announcement. The bottom and top bezels are hug... moreIt doesnt matter if its huge..some people like a huge phone.. And it doesnt matter as long as it is play station certified! I can play to my huge phone with a nice grip on it in landscape :) Sony is so smart by thinking of that also ! Android Man, 06 Sep 2013Sony's press conference was the best ive seen. so much tech they bringing out. just awesome. ... morewhat?? what tech did they bring?? a 20mp camera wich is not that great...i really was expectig more...SAME DESIGN, taller and fatter, same huge bezels...they changed the speaker, camera, and the frame around, the aluminum frame and thats it..the Z1 is just an improved Z, nothing else...still really beautiful! dont be such a fanboy man..both are really great. If you dont like the Note, just forget it...you dont need to bash Samsung like all the fanboys. There are people who love and hate both devices. AnonD-141635, 06 Sep 2013one thing that i cant understand is why does sony uses overwhelmingly black elements in its UI... morebetter battery life , this are direct led making it save a bit of battery. completely removing me from buyers list. Nice with the updated camera samples but hardly telltale shots, the hardwarezone Singapore ones are still the most informative ones, focusing on iso settings and other details. I was really planning to buy the z1, until the announcement. The bottom and top bezels are huge, very heavy for a phone, even 1g heavier than the phablet note 3 (i know a gram isn't much, but the note 3 have 5.7 inch screen and 3200 mah battery). I wouldn't giveaway portability for camera. Looks like my money is on z1 mini then. Samsung always tell us about features we don't really need, like gesture and eye control, I mean the phone is always in yo hands why do u have to use those things and worst of all they come up with something I think they call it groupplay were u can play 1 song in 8 devices what for. Sony's press conference was the best ive seen. so much tech they bringing out. just awesome. Samsung's was a big dissapointment. shame though. 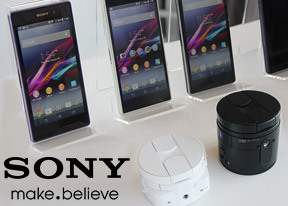 So Sony stole IFA berlin this year.